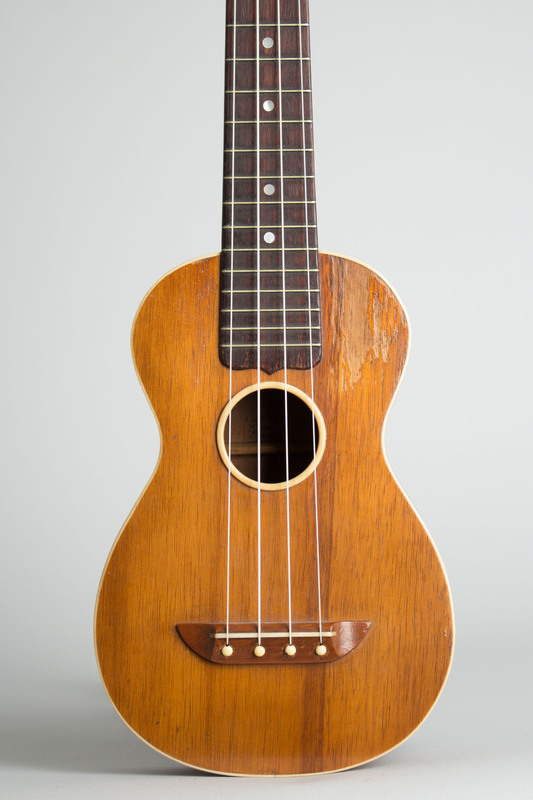 Washburn Style U-C Model Soprano Ukulele, c. 1924, made in Chicago, serial # 8886, natural finish, koawood body, mahogany neck with rosewood fingerboard. 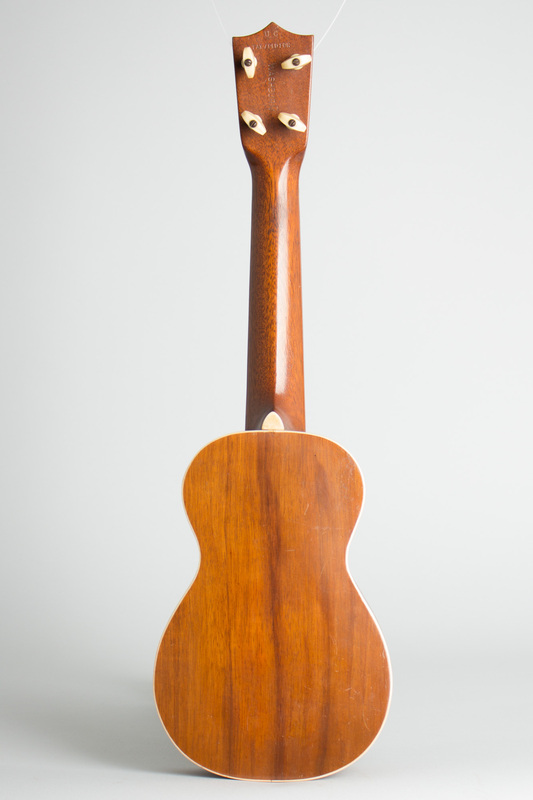 This is a lovely Koa wood ukulele from Lyon & Healy with an ivoroid-bound body and Washburn's unique patented features including the "smile" bridge with pins and a bone saddle and a grained ivoroid sound hole ring. 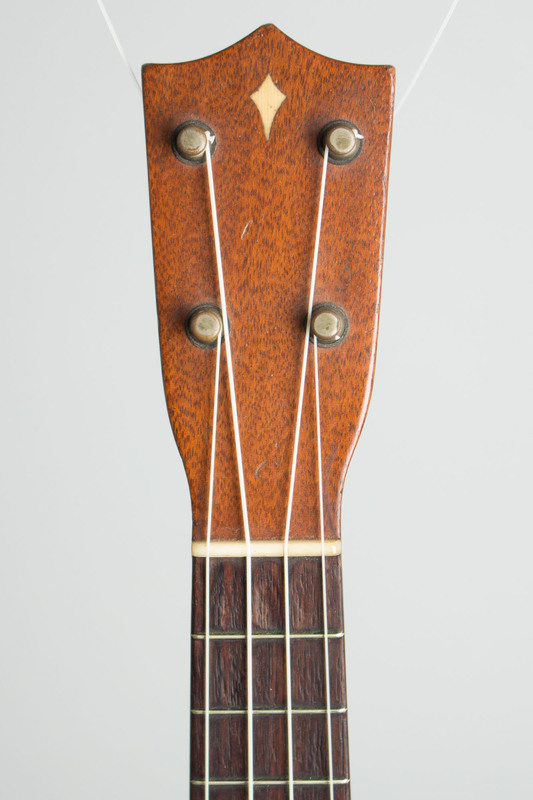 The mahogany neck features a pearl dot inlaid long rosewood fingerboard, bone nut, and a celluloid kite inlay in the headstock. 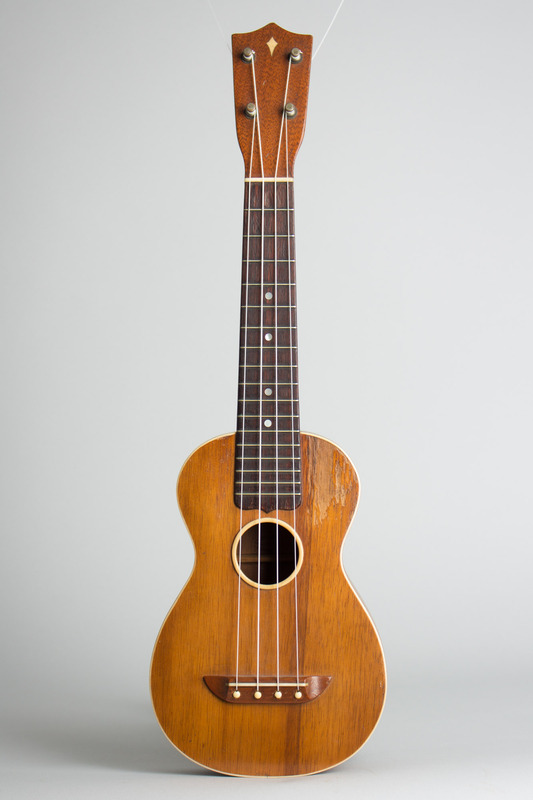 This was a fairly expensive instrument ($25.00) when new and is still a very fine uke today. Overall length is 21 in. (53.3 cm. 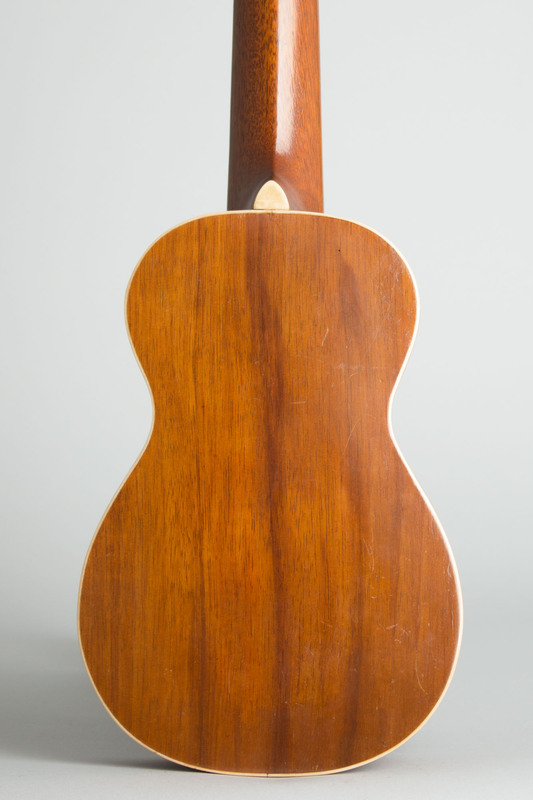 ), 6 1/2 in. (16.5 cm.) wide at lower bout, and 2 1/4 in. (5.7 cm.) in depth at side, taken at the end block. Scale length is 13 3/4 in. (349 mm.). Width of nut is 1 3/8 in. (35 mm.). Very nice original condition overall; no cracks, a bit of old glue around the celluloid heel cap, but no other repairs. 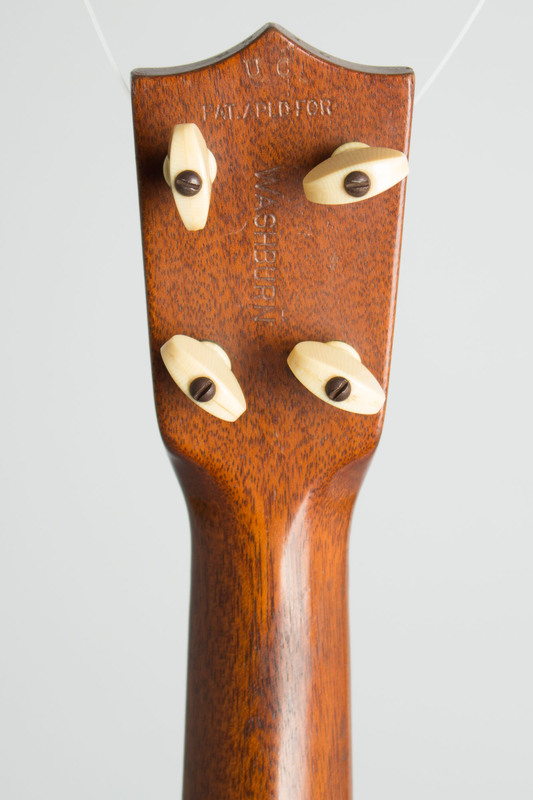 There is light wear overall but there is one area of fairly deep fingernail damage through the finish to the top, just below the fingerboard. 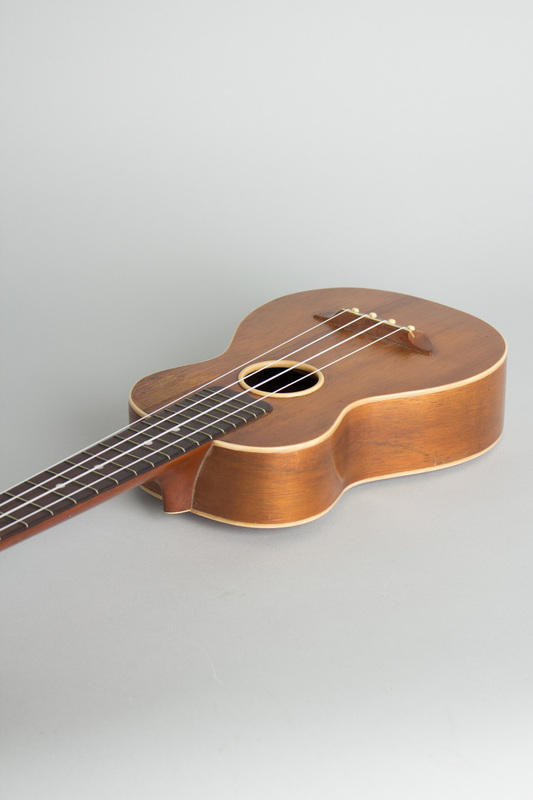 Plays well in the lower positions; action is a bit high above the 5th fret, but for traditional uke playing is quite functional with a very good sound. Excellent - Condition.